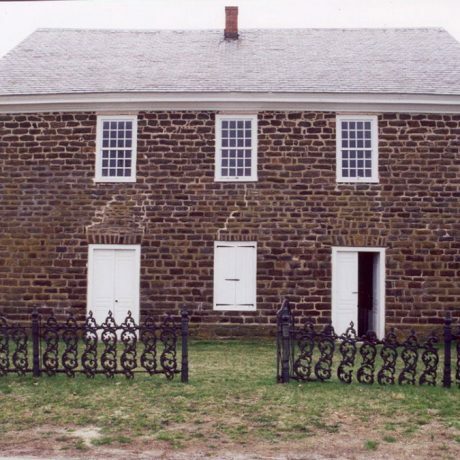 2004: The Presbytery of West Jersey received an NJHT grant in 2004 for the structural stabilization of the meeting house. This grant funded repairs to the slate roof and stabilization of the walls, which were bowing outward under the weight of the roof. 1/2010: The building is stabilized, but remains without a long-term use plan. Old Stone Church, as this nearly pristine example of an austere, Georgian style Presbyterian meeting house is generally known, was built in 1780. It is surrounded by an early eighteenth-century graveyard that is among the oldest in southern New Jersey. The congregation built a new church in Bridgeton in 1850, after which they used this building in the hamlet of Fairton, occasionally. Services are currently held only once or twice a year since the building has no electricity, plumbing, or heating. The Cumberland County Historical Society assists the Presbytery of West Jersey, which still owns the building, in maintaining it. But neither organization is prepared to meet the costs of preserving a building that has not been regularly used in a century and a half. The Old Stone Church is an important reminder of the place of Presbyterianism in the religious life of New Jersey during the era of the American Revolution. A long-term answer for Old Stone Church must combine a plan for more active use of the building with a way to raise sufficient funds to rehabilitate it. The Presbytery has organized a committee to work on grant applications for securing funding and is also collaborating with the Cumberland County Historical Society to augment the Church’s use as a community center.